Flo lives an eccentric life—she travels with a popular circus in which the main acts star orphaned children with secret shape-shifting abilities. Once Flo turns sixteen, she must perform, but she's not ready. While practicing jumping a flaming hurdle in a clearing beside the circus, she spots a dark figure in the trees and fears he saw her shift. The news sends the circus into a panic. In Flo's world, shifters are unknown to humans with the exception of a secret organization—the EOS, referred to as "hunters." Hunters capture and kill. They send some shifters to labs for observation and testing—testing they don't often survive—and deem others useless, a danger to society, and eliminate them. To avoid discovery, shifters travel in packs, constantly moving and keeping themselves hidden. Up until now, the circus was the perfect disguise. Believing she has brought attention to the group, Flo feels dread and anxiety, causing her to make a mistake during her performance in front of the audiencea mistake that triggers a violent attack from the hunters. 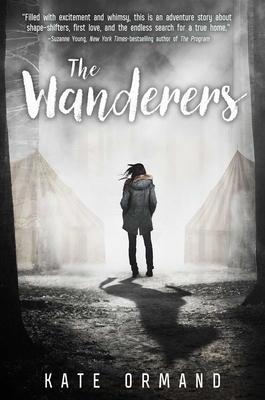 Flo manages to flee the torched circus grounds with Jett, the bear shifter who loves her; the annoying elephant triplets; and a bratty tiger named Pru. Together they begin a new journey, alone in a world they don't understand and don't know how to navigate. On the run, they unravel secrets and lies that surround the circus and their lives—secrets and lies that all point to the unthinkable: Have they been betrayed by the people they trusted most? Kate Ormand is the author of Dark Days. She graduated from university with a degree in fine art painting. There, she discovered her love of reading YA books, prompting her to try a new creative angle and experiment with writing. Kate also writes children’s picture books under the name Kate Louise. The Pack, the sequel to The Wanderers, will release in Fall 2017. She lives in Cheshire, England, with her family, her partner, and a cocker spaniel named Freddie.